Christie visual display solutions will be shown at Booth #4531 at San Diego’s DistribuTECH, February 3 – 5. The company will demonstrate control room solutions that range from the Christie Entero HB 70-inch HD front access video wall cube, to the Christie Velvet high-resolution LED tiles. Also on display will be the Christie Phoenix network distributed open content management system. 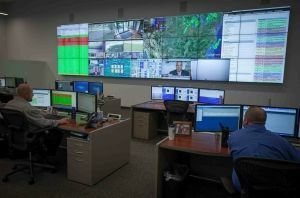 Christie control room solution in use at American Water. Rounding out the Christie display at DistribuTECH will be the narrow bezel flat panels that include the 46-inch Christie FHD461-X flat panel and the 55-inch Christie FHD552-X flat panel – both professional grade, high-definition flat panels for tiled display walls. Christie’s control room solutions are part of installations at major utility companies globally such as India’s North Eastern Electric Power Corporation Limited (NEEPCO), under the Ministry of Power, which covers 47 percent of the total electricity consumption of the north eastern region and American Water, a leading provider of high-quality water and waste-water services in the United States and parts of Canada. Christie Entero HB 70-inch HD front access display cube – The Christie Entero HB series offers wireless control through Wi-Fi capability. A motorized, 6-axis adjustment system for front access offers installation flexibility. Designed for zero maintenance, the Christie Entero HB is an option for installations that need true HD LED display cubes in a 70 inch 16:9 form factor. audio/visual information found in a control room environment. Christie FHD461-X 46-inch HD LCD display – The Christie FHD461-X offers high-contrast and color-rich visuals in tiled video wall displays. It integrates easily into areas where space is limited, while mounting options make it easy to service.